If you visit Linlithgow Palace, one of the principal residences of the Kings and Queens of Scotland during the 15th and the 16th centuries, and if you are one of those attentive tourists who take great care to read every information board, it won’t take you long to spot an ‘Elen More’ among the courtiers of King James IV. Or the ‘Moorish Lass’, as they dubbed her. Who was Elen More? 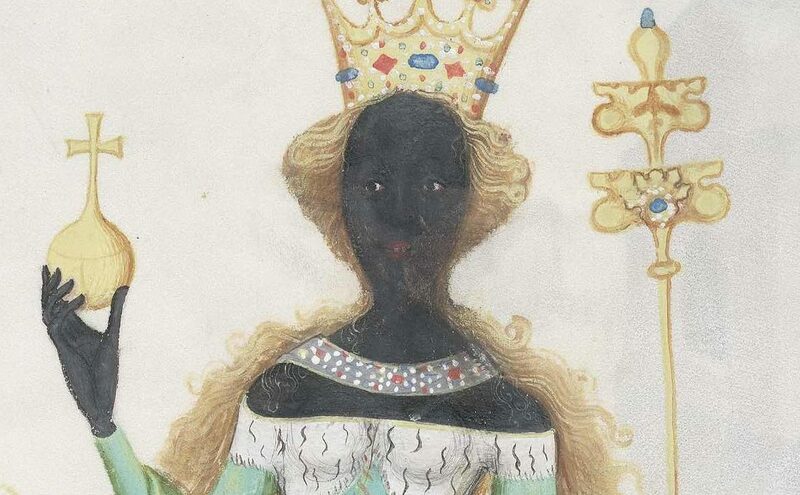 The most immediate answer would be that she was one of Margaret Tudor’s maids and a favourite of the royal household, for she was pampered with costly clothes: in the Treasurer’s account for 1512, a ‘Blak Elene’ or ‘Elen More’ was gifted five French crowns, and again, in 1527, 60 shillings were gifted to ‘Helenor, the blak moir’. In between, there are other records of money or expensive gifts given to ‘blak maidin’ or ‘blak ladies’, who might be or include Elen More. But human life is seldom as simple as it appears, and there is always more to tell. Elen More was not Elen More to start with; and, if we trace her story as far back as possible, we will find a rather sinister beginning. In Black Lives in the English Archives, 1500—1677, having thoroughly examined documents from various source, the late Imtiaz Habib uncovers a black population in English history in a time period ‘before English black populations became known through the transatlantic slave trade’. Starting from 1500, he traces the presence of African people in the English court to Henry Tudor’s Spanish policy and connection, thus situating the British Isles in a larger European political, social, and economic context. As a result, in 1501, several black people arrived in the Tudor court as part of Catherine of Aragon’s royal retinue, as noted in a letter exchanged between the princess’s parents and their ambassador in England, and as observed by a youthful Thomas More. Meanwhile, in Scotland, the first African who made into the Treasurer’s record is a Petir More in the year 1500/1. His presence in Edinburgh, Habib argues, probably has its roots in the privateering of the Barton Brothers of Leith. The Bartons had a letter of Marque that legitimized their pirating Portuguese ships, which were often loaded with human cargo from West Africa. People like Petir More were brought into Scotland, in other words, as booties. This is probably also how Elen More came to Scotland. Habib’s evidence shows a transportation of two African women to Dunfermline entered the Treasurer’s account in 1505, though their arrival in Leith is more likely to have occurred at the end of 1504 and the record might be entered at a later date. These women remained nameless until they were christened and baptised, respectively, as Elen More or Helenor and Margaret More. They were named after Queen Margaret and Eleanor Pole, the queen’s principal lady-in-waiting and daughter of Lady Margaret Beaufort’s half-sister; this, as Habib argues, makes it ‘unsurprising’ that their visibly pampered life started immediately after their arrival at the court. Between those two, Elen More seems to have achieved more public prominence: she was enthroned as the Black Queen of Beauty in a tournament in 1507, which was repeated more elaborately in the following year. Both events were held in a field near Edinburgh Castle. Lavishly attired, Elen was cast as the prize for the triumphant knight. King James IV joined the tournament and disguised as the ‘blak knicht’ and acted as Elen’s champion. The winner of the tournament would win a kiss and an embrace from Elen, while the loser had to come behind and kiss her hips. Of course, the king won in the end, in case anyone has been wondering. She gleams as bright as a tar barrel. My lady with the huge lips. Schou blinkis als brycht as an tar barrell. Although Dunbar’s poem locates itself within the ‘flyting’ tradition, the representation of Elen More is vicious, especially when, in the previous stanzas, Dunbar likens her facial features to ape, toad, and cat, displaying an attitude that ‘anticipates the racism of subsequent discourse of empire’ (quote from The Lives of Girls and Women from the Islamic World in Early Modern British Literature and Culture by Prof. Bernadette Andrea). Dunbar’s poem shows that the luxury Elen More and her companion enjoyed is but one side of the story. Despite all, they were but a novelty, objects to be put on display so the court may have an extra exotic flair. But on the other hand, their presence and impact at James IV’s court are historically significant. Top Image: The Queen of Sheba, from a 15th-century manuscript of Bellifortis.